Hi there! I am so excited to start some Jaded Blossom Sneak Peeks! This next release is a LOT of fun!! Today Jaded Blossom is showcasing 2 stamp sets! They are called Pattern and Friendly Kisses! I made a cute little treat bag! The sentiment circle is from the Friendly Kisses set! The red and black polka dot circles are from the Pattern Kisses set! Thank you for coming is from the Friendly Kisses set! The ladybug is from the Doodlecharms Cricut Cartridge! These stamps are really cute and can dress up all sorts of candy! Don't forget to check out the rest of the Design Team for more inspiration! Another sneak peek will be posted tomorrow! Lovely ladybug. I sure do like the matching cirlce on the bottom of each kiss. So cute love that little ladybug. Love this ladybug and all the dots!! 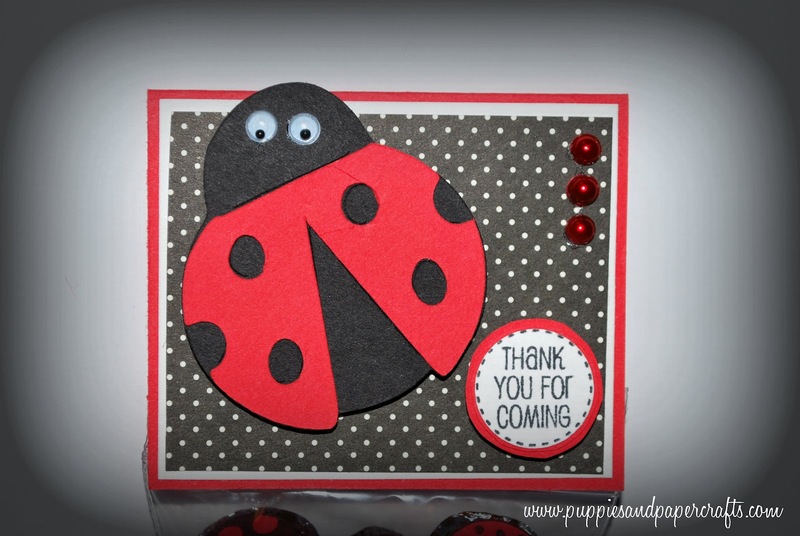 Love the ladybug and the color combination! SUPER cute!!! this is of course super cute !!! would be a great girl party favor love it !!! So cute! ♥ all the polka dots!! !